And this time I would like to share with you several activities and worksheets on how to teach questions with THERE IS and THERE ARE. I have used all these activities with my students and they worked. Start the lesson with explaining the grammar. Do not complicate the matters. Just say that we use this phrase when we want to know whether something is somewhere. Allow your student to use the following infographic during the follow-up activities to make sure that they use the correct form. There are threes peaking activities I have created. In the first one, print the following worksheet for every student. First, ask them to write the names of the facilities under the pictures at the top of the picture. Then think of one of the pictures and tell the students they have to ask There is/There are questions and find out which picture you are thinking of. Then they work in pairs. One of them thinks of a picture and their partner tries to find out, using THERE IS/ THERE ARE questions. When he/she manages to guess the picture they swap their roles. For the second activity, you need to print the worksheet twice. Cut out the towns 1-8. Hand out the pictures to your students so there are always at least two copies of the same town in the group (of course, there can be more copies if your groups are really large.) The students must not show their pictures to anyone and they have to find someone with the same picture. They have to ask THERE IS/THERE ARE questions. The third speaking activity is called The same or Different? Print out the following worksheet and cut it in the middle. Students work in pairs. Each has one half of the worksheet and they must not show it to their partner. They ask THERE IS/THERE ARE questions and their task is to find out whether the corresponding pictures are the same or different. 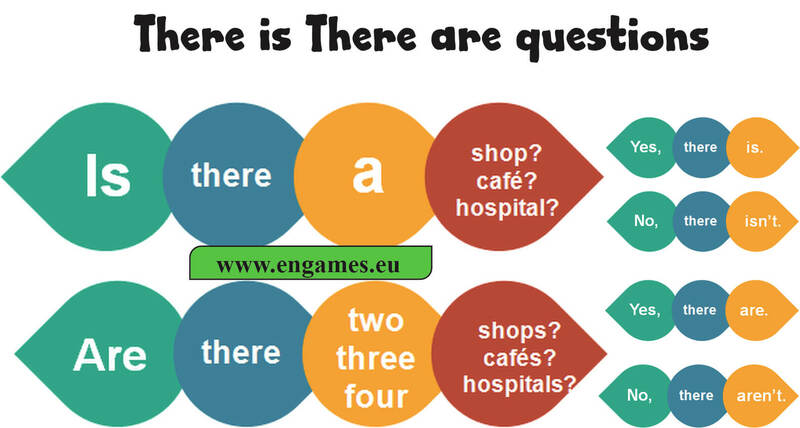 The following quiz can help your students practise the THERE IS/THERE ARE questions either at school or at home. The quiz consists of two parts. In the first part, students should match the beginnings and ends of the questions. In the second part, students have to complete the questions and the answers. The students will be rewarded with a game after each part of the quiz they pass. The quiz is in HTML5, so it will play on all desktops and mobile devices.